Maybe your deck wasn’t quite as good as you wanted it to be, so you caved in and loaded it up with key commander staples like Time Stretch, Terastodon and Rhystic Study. Even after doing all of that, the next game you get a chance to cast some bombs, but ultimately your opponent bests you, not because they cast bigger bombs, but because they did more with each card they played, not just the bombs. Maybe if you had read a few more Ernest Hemingway quotes, you’d be better at deck building. This week, I show you why. 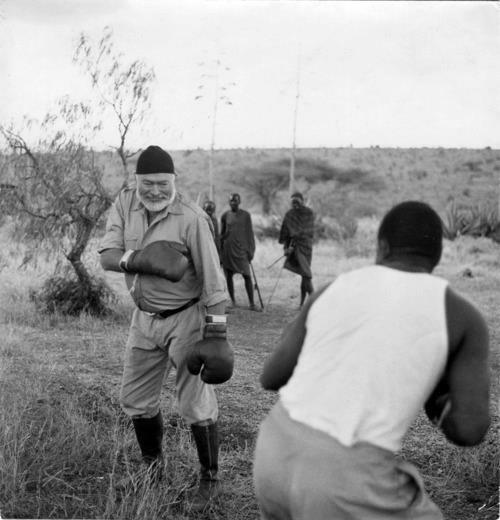 You might think of Ernest Hemingway as some old and gone author who wrote a book you Spark-Noted at some point in your education. I’m not going to go into a full blown literary lesson here, but I think it will suffice to say that Hemingway wrote great novels about eating rabbit stew and bedding women. He invented the Mojito and the Daiquiri. He also survived two plane crashes. He was an American badass. 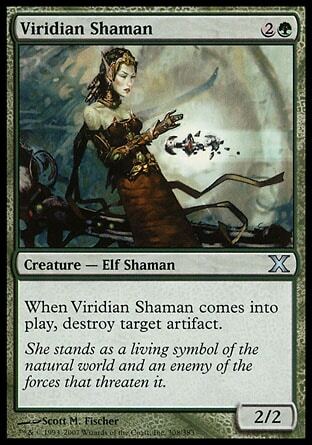 Its tough to follow up a juggernaut of a quote like that with a lame Magic article, but I’ll give it a shot. Basically he’s saying he never purposefully aimed to have his story symbolize a couple of main themes. He just wrote a story and if he gave each individual element enough life, it would all come together into a cohesive whole that could mean much more than the sum of its parts. Now compare the heavy handed approach of shoe-horning a life lesson or two into a story to sprinkling in staples into your commander deck. If you do a good enough job of taking the time to build your deck, and more importantly, focus your deck, then it’s going to come together with much more synergy. Cards on their own won’t be as singularly splashy, but the entire 99 is going to be working together in better harmony. I should clarify that it is fine to include staples in your deck, but my advice is to limit their use to when they directly fit your goal. You really should ask yourself “Does this card work with my other 98? The fact that a card is good and everyone plays it doesn’t mean it’s going to be the best fit for your deck. You don’t need to take a popular two card combo and find a spot for it in your deck. 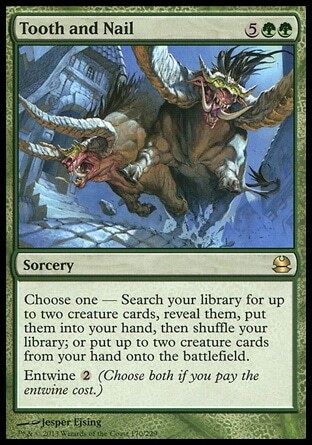 If those two cards on their own don’t have much synergy with the rest of your deck you didn’t do yourself any favors. If you do a good enough job selecting cards for the entire list you will often find synergies and combos that seem to materialize where you never initially intended them to. I let a friend borrow it. Mikaeus had gotten exiled earlier in the game. Later on he cast Triskelion assuming it had some kind of reason for existing in the deck. I had to explain that it wasn’t very good now because it’s main reason for existing was to combo with Mikaeus. That got me thinking. Why am I running these three cards at all? 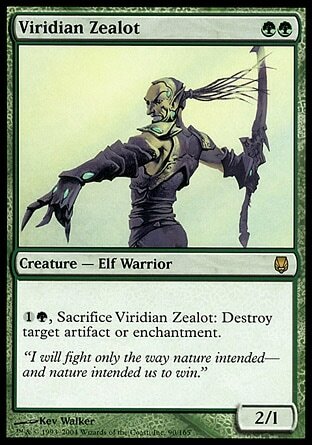 The deck focuses on recurring artifacts like Executioner’s Capsule to get value and win the battle of attrition. 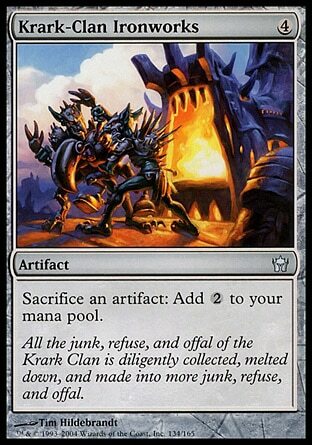 It eventually ramps into a big spell via Krark-Clan Ironworks to finish off games. There aren’t a lot of two creature combos in the deck, so Tooth and Nail isn’t very exciting outside of ol Zombie Mikaeus and Triskelion. There isn’t a big creature sacrificing theme, so Mikaeus doesn’t help a lot outside of rescuing a creature or two if they die. It’s not like I get extra value out of persist creatures with him, there are none in the deck. 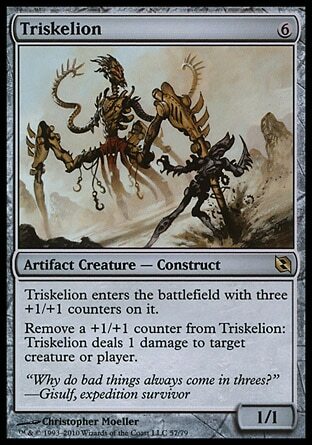 Also at 6 mana Triskelion is pretty underwhelming on its own. 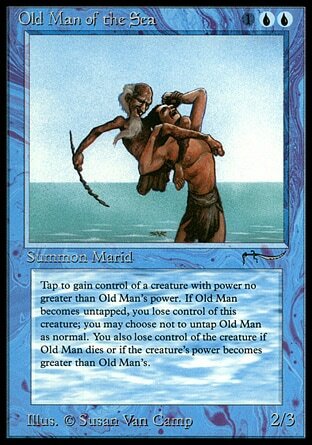 This is a great example of some staples that got shoe horned into a deck as a wincon. All three cards are artifacts, so on their own can be recurred with my general. All three cards on their own are going to be useful. 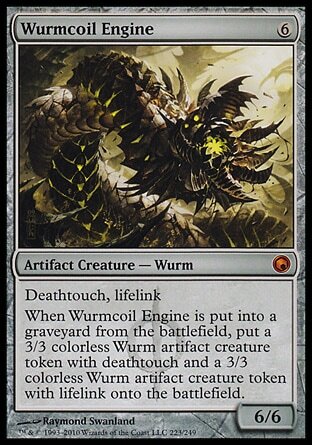 Wurmcoil is much better at 6 mana than Triskelion, providing life gain to fuel Necropotence and just being an all around badass creature. The Ironworks fuels a ramp strategy, and with Glissa, those trinkets you just sacked for a big mana boost can be recurred. 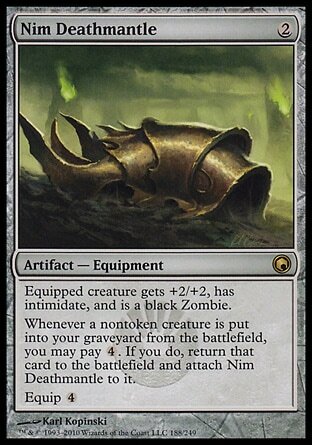 Nim Deathmantle gives me an artifact based method of returning a creature that just got picked off back into play. Lets say someone tries to kill my general, I can either pay 4 to get her back, or if the Ironworks are in play, I can sac two trinkets to get her back. Of course when all three are in play you can kick start an infinite wurm token engine. This new trio has a lot more synergy with the rest of the deck. They aren’t just staples for the sake of including staples, like the Tooth and Nail combo was. It should also be a lot more fun and rewarding to assemble a three card doomsday wurm machine than plunk down Tooth and Nail and win. I was already running the tried and true Acidic Slime, but by digging a little further I was able to find more creatures that did a good impression of Krosan Grip. 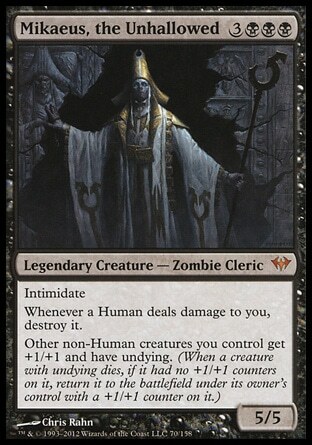 Plus, since the deck is so creature based and focused it’s much easier to tutor for these guys in a pinch. Once they have outlived their usefulness they can feed the beast and be recurred much more easily than an instant could be. With all of the tokens the deck pumps out Nullmage Shepherd can turn into a real machine gun. Instead of a one shot instant, I get additional value. These are some very basic examples of how you can get a thicker web of synergy in your deck. Focusing your deck lists is a great way to not only improve how fun and interactive your deck is, but it can also be a way to eliminate staples that you might be getting bored of playing. Like in the Glissa deck, once I committed more to artifact synergy and focused on those mechanics I was able to replace an extraneous combo that didn’t really mesh with anything else. I took out the big splashy spell to add more gears to power my value machine. Now I have boxes of value showing up in the mail everyday. If you ever get stuck for ideas while piecing together a new deck, try reading up on your classic American authors. They dish out deck building advice like its their job.